[Note: In a few previous posts on my own blog, I've analyzed some of the impacts of the polls and where I thought the race was actually at. There's some good background on the analysis below here and here and here]. The final debate is today. Going into it, I thought the exercise below would be useful, since I suspect the polls will change in the next week. 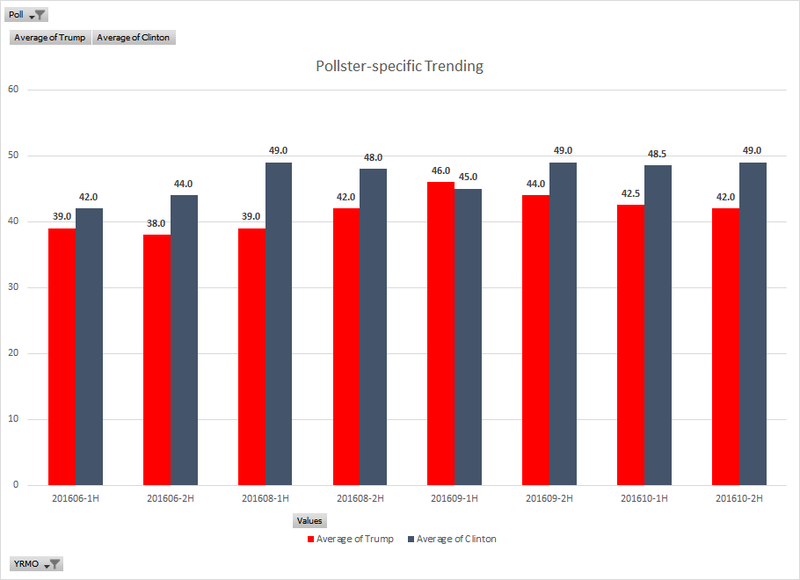 Rather than looking at the race today, I thought I'd take a look at the polls themselves and see if there's any accounting for the Hillary Clinton October surge that is seemingly suspect. A couple of things have jumped out. Following are polls from the RealClearPolitics average of polls, looked at in isolation. 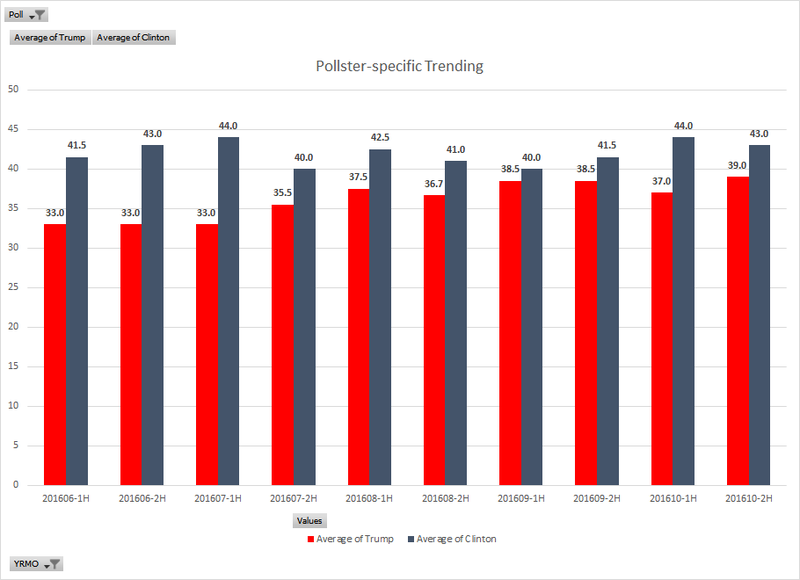 In each case I've looked at polls sectioned into the 1st half /2nd half of each month dating back to June 2016. Let me add a caveat here. 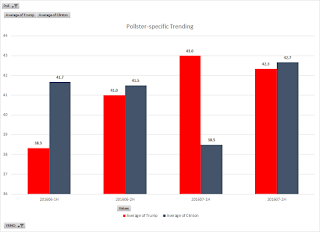 There is an additional overlay that is needed here which is to compare these polls to how they performed or assessed Trump and Clinton in the primaries. 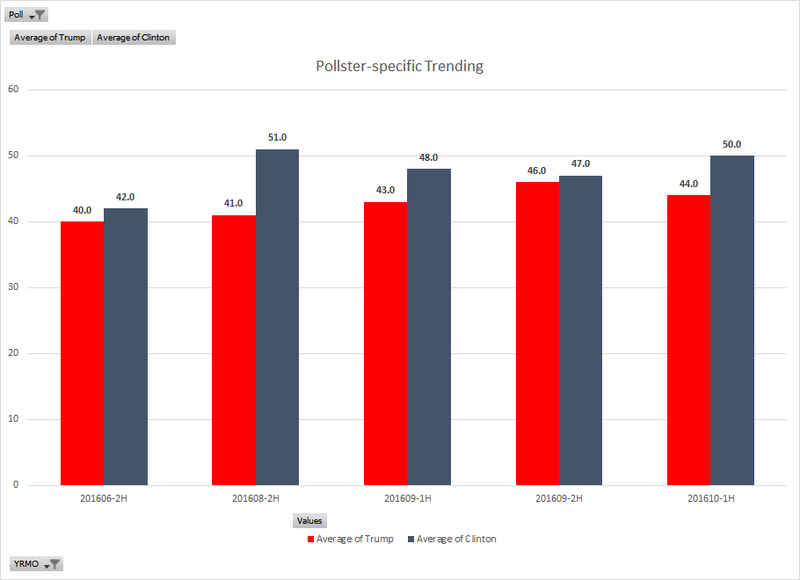 A lot of pollsters predicted Trump's death during the primaries. Many of those who were wrong are predicting the same now. And that should be factored in as an adjustment factor here. I have not had the opportunity to do that here. 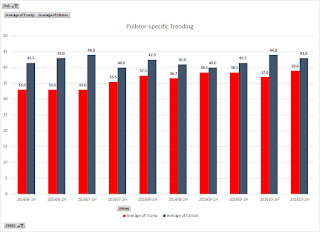 Another thing that should be factored in is that the polls don't all share their weighting of polling participants. They are black boxes and those methodologies definitely can skew results. Not making that methodology available makes a poll suspect in my eyes, as a hidden methodology allows the opportunity to manipulate results. In turn, I have also not had the time to review most polling crosstabs where they are available, so there's some culpability on my part as well. 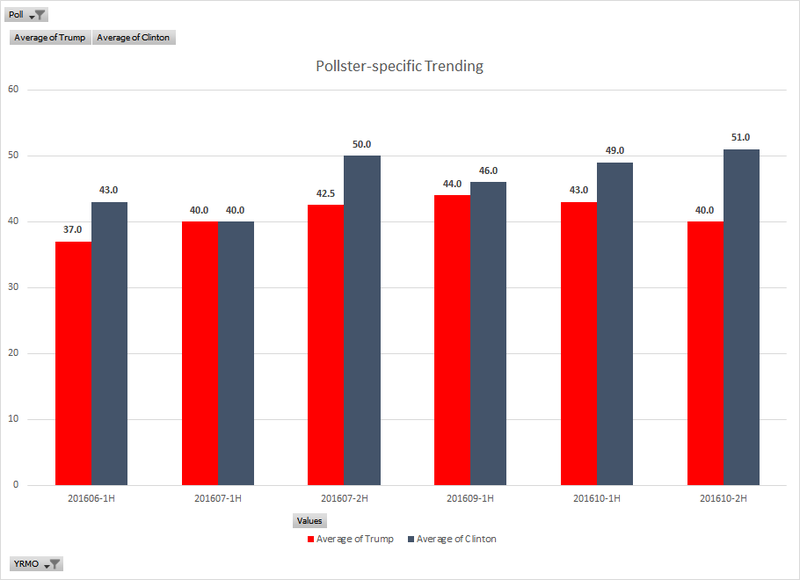 Firstly let's take a look at Rasmussen, a pollster generally regarded as conservative-leaning. I've selected this one first because there is an obvious point that comes from it. Here's what a trend of their polls look like. Forget the trends, look at the x axis. The last included Rasmussen poll included is from July. But Rasmussen is still polling to this day. Rasmussen has the race tied. But it does not reflect in the RCP average anymore. Why not? That's strange. Next let's look at the LA Times polls. This poll is an outlier as it has Trump leading. 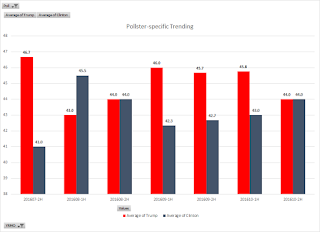 This poll has caught a lot of flack from pollsters and journalists but it has been a consistent methodology poll and therefore can indicate a trend regardless if the polling mix is correct or not. To me this poll indicates a narrow "trading range" for each of the candidates : Trump 43 to 46 and Clinton 42 to 45.5 since early August. 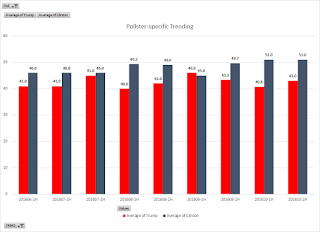 This poll displays much less fluctuation than other polls and is probably more reflective of decided voters since the same voters are being repeatedly polled whereas in other polls we see a fresh set of voters each time. The takeaway is that Trump voters are likely not abandoning him. Rather the question regarding this poll is, "have they selected a truly representative sample of voters?" In contrast to the LA Times polls, CNN-related polls tell a different tale. CNN showed a narrowing race, as did many polls through the first half of September but a suddenly widening gap in October. 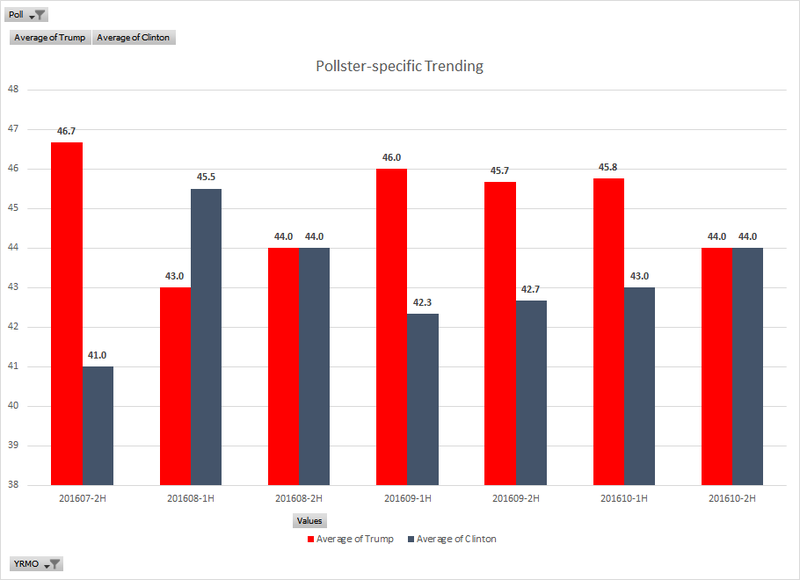 That's representative of the RCP average of polls and reflects the narrative that the October surprise of Trump's verbally abusive hot microphone comments. Is that properly reflecting the present situation? At odds with the LA Times, that's the real question, which we do not know the answer to as of yet. CBS, echoes the CNN narrative but with a wider divide throughout, settling in at 11 points so far. That seems unrealistically high, nevertheless the trend observed in CNN related polls is echoed here. Fox News, cognizant of their viewer base but nevertheless an establishment institution mirrors CBS but on a smaller scale - either in an attempt to ameliorate the feelings of their viewers or in an unintentional bias in their polling. The question is - does the bias overstate or understate Trump support? Over the last 6 weeks, Fox has had a Clinton lead ranging from 5% to 7%. 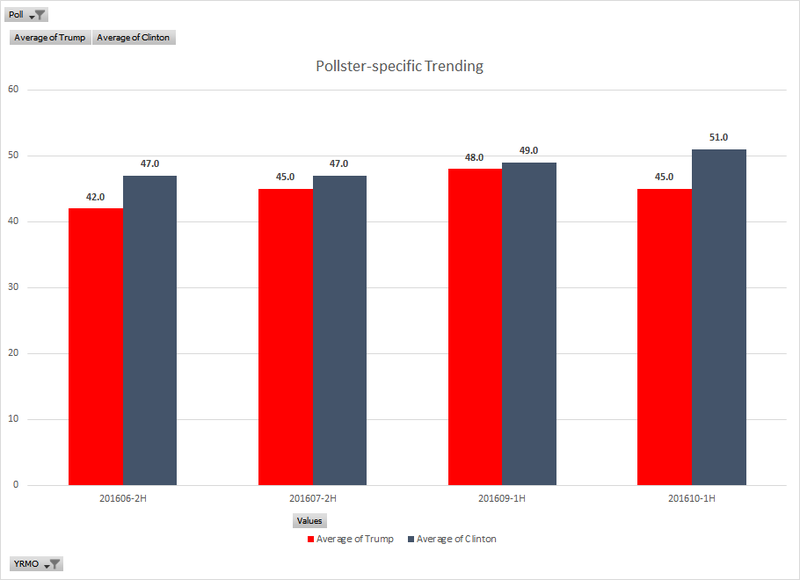 Only in the first half of September was the race really tight in their polling. The consistency mirrors the LA Times a little better than other polls. That's interesting: (1) is the consistency more reflective of the race than the sudden swings (I believe it probably is) and if so (2) is the Fox polling getting a better or worse sample than the LA Times? Their view of the post Labor Day Trump free fall has him bottoming out in the first half of October and already rebounding. Has their sampling changed? They seem to be an outlier in terms of a Trump recovery or support turnaround. On the other hand, they are showing Hillary above 50%. That's definitely an outlier at this point. That's not to say it cannot happen and they may be a leading indicator of that but at this point I'd be very reluctant to believe her support has surpassed 50%. 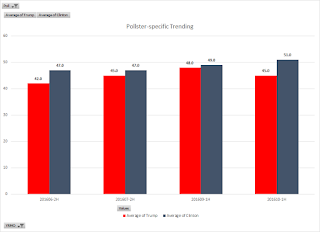 What's interesting about Reuters-related polls is that Trump never breaks 40% and Hillary and Trump combined are very low numbers, indicating a large number of undecided and/or other party voters. Hillary Clinton never breaks 44%. Interestingly, the Trump slump here also appears to reverse in the second half of October. I also looked at Monmouth and Quinnipiac. 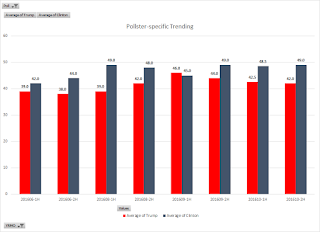 The former interestingly has polls showing up consistently in the latter half of the month and the latter seems to be overdue for another poll. Both, seemingly refuting my earlier point about Hillary Clinton support not exceeding 50%, so perhaps there is some evidence that should could be there now. Again, the evidence is thin, but there is more evidence than I mentioned above. Take from the two pollster views below, what you will. If pollsters are skewing results, they will have to rid themselves of their biases over the next two weeks if they wish to maintain an air of expertise. If the election rolls around and your polls are off - you get hammered. Zogby used to be included in the RCP average but was way off in recent elections and got themselves bumped from not only RCP but from the media in general. Pollsters don't want that for themselves. The debate tonight affords them the opportunity to adjust any bias. If Trump or Hillary Clinton slays the debate, there's an immediate opportunity to adjust accordingly. 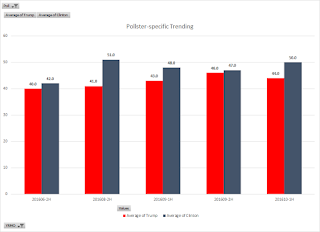 But if the polls are prejudicially skewed by the pollsters (say against Trump), and the debate is close to a draw and they have to adjust Trump's support upwards, where does that leave them in explaining the late shift? Late deciders are breaking for Trump? That's a tough pill to swallow given the build-up in the narrative to this point. 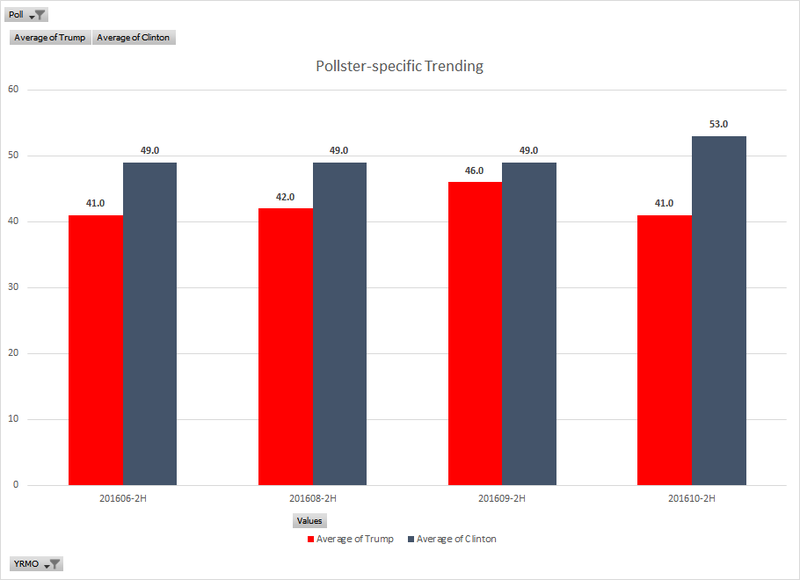 At this point one thing is clear, the post election poll analysis is going to be a lot to sift through, but it will probably be quite revealing, regardless of who actually wins the election.